Deadly Legionnaires’ outbreak in Sydney’..
Ray Hadley has revealed an outbreak of the deadly Legionnaires’ disease in Sydney’s north-west. On Monday a man presented himself to Wyong Hospital with the disease. He told doctors he lives on the Central Coast but works at Castle Hill. 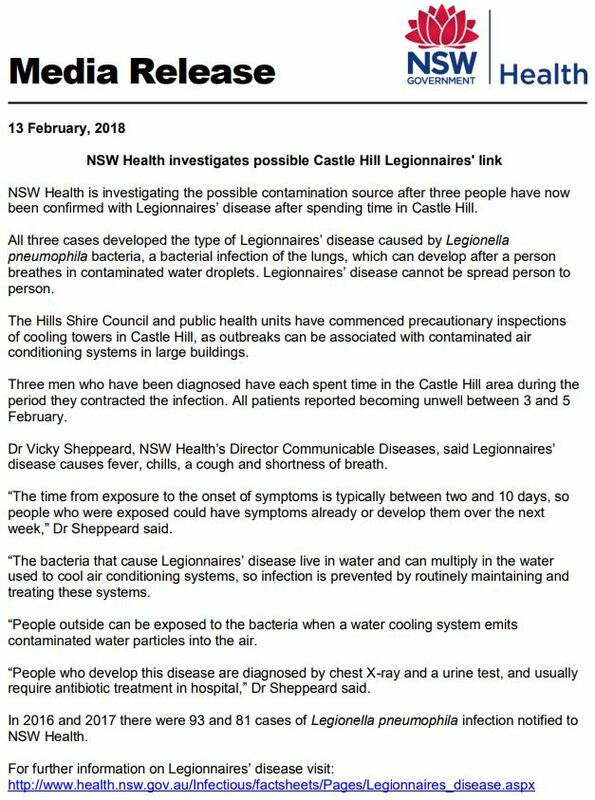 Initially NSW Health denied there was an outbreak, but the department has now confirmed to Ray Hadley three people have contracted the disease, all with links to the Castle Hill area. Dr Vicky Sheppeard, NSW Health’s Director Communicable Diseases updates Ray on the situation. “We’ve found that these three men who’ve all been notified to us in the past week were somewhere in the Castle Hill area. “It does give us something to go on. Based on this information we can now have some cooling towers that we can start to look at to see if there is any risk.